The airline transport pilot reported that, as the flight neared the destination airport, the engine experienced a total loss of power. The pilot switched from the left fuel tank to the right tank and turned the auxiliary boost pump on, which restored engine power momentarily. Shortly thereafter, the engine again experienced a total loss of power and the pilot performed a forced landing. Postaccident examination revealed no useable fuel in the left tank, an estimated 20 to 25 gallons in the right tank, and no evidence of fuel contamination. Examination and test run of the engine revealed no mechanical anomalies that would have precluded normal operation. Although the turbocharger manifold exhibited a crack around its circumference, the crack would not have appreciably degraded engine performance at the altitude at which the airplane was flying when the loss of power occurred. Given the lack of fuel in the left wing tank and the fact that the engine operated without anomalies during postaccident testing, it is likely that the loss of engine power was the result of fuel starvation due to the pilot's mismanagement of the available fuel. The pilot's inadequate in-flight fuel management, which resulted in a total loss of engine power due to fuel starvation. On April 15, 2018, at 1048 mountain daylight time, a Cessna T210N airplane, N6988N, lost engine power while approaching the City of Colorado Springs Municipal Airport (COS), Colorado Springs, Colorado. 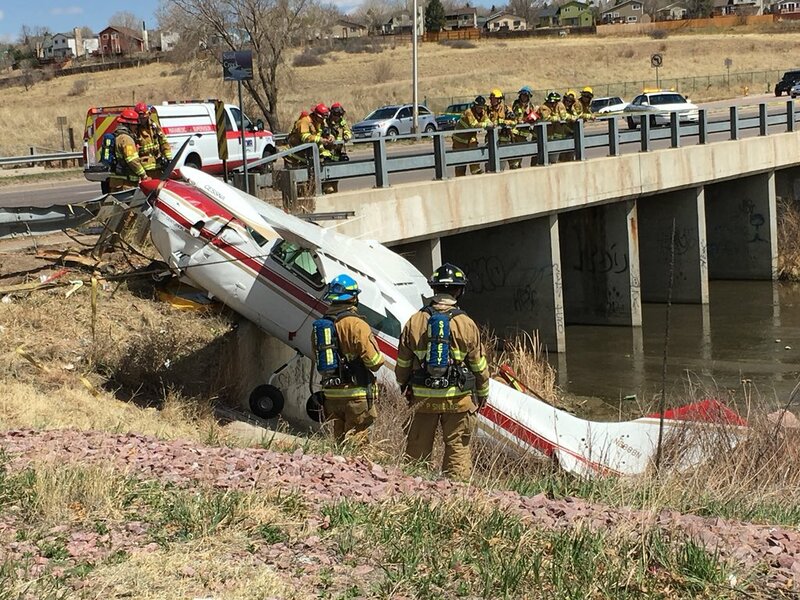 The pilot made a forced landing in residential area 3 miles north of the airport. 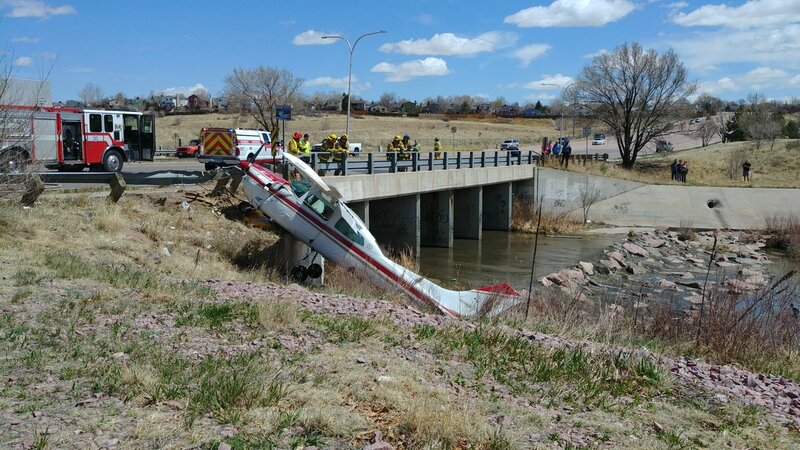 During the landing, the airplane struck an embankment and was substantially damaged. The pilot and one passenger were not injured. Another passenger received a serious injury. The airplane was registered to CAG International, Inc., and operated by Elite Aviation, Longmont, Colorado, as a Title 14 Code of Federal Regulations Part 91 personal flight. Visual meteorological conditions prevailed, and a visual flight rules flight plan had been filed. The flight originated from Vance Brand Airport (LMO), Longmont, Colorado, about 1000, and was destined for COS. According to the pilot's accident report, he was at 9,500 feet msl (mean sea level) and was being vectored for landing at COS when the engine lost power. He switched from the left fuel tank to the right fuel tank and turned the auxiliary boost pump on. Engine power was restored. Shortly thereafter, the engine lost power again. The fuel flow gauge indicated zero, and the fuel pressure gauge was intermittent. 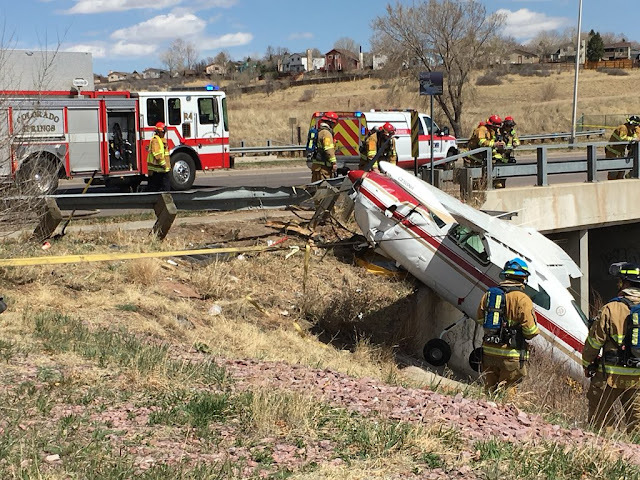 The pilot extended full flaps and the airplane ballooned over an embankment, landed hard, bounced over a median and struck a guard rail. Post-accident examination revealed no fuel in the left tank. An estimated 20 to 25 gallons was drained from the right tank. No contamination was noted. 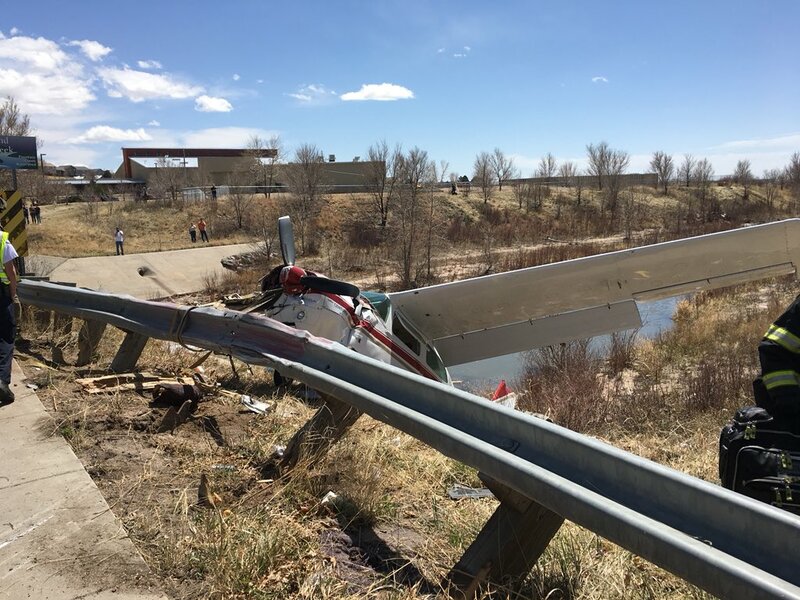 On April 24, the airplane was examined at the facilities of Beegles Aircraft Service in Greeley, Colorado. The Federal Aviation Administration and Continental Motors were in attendance. The top spark plugs, although dark in color, were oil-free. The engine was rotated manually, and thumb compression was achieved on each cylinder. No binding was noted, and crankshaft and camshaft continuity was confirmed. Spark was noted at all top ignition leads when the engine was manually rotated. The fuel hose between the engine driven fuel pump and the engine fuel manifold contained no fuel. Fuel was found in the hose to the fuel flow indicator on the instrument panel. The airframe fuel strainer was full of fuel. The screen was clear of any contamination. the turbo compressor wheel was undamaged, and the compressor wheel rotated smoothly. The engine was shipped to Continental Motors, Mobile, Alabama, and was examined on June 20 and 21. When the turbocharger was removed from the engine, evidence of hot gas seepage was noted on the manifold. A crack had developed and had propagated almost completely around the base of the flange. Another manifold was installed and on June 22, the engine functionally tested in a test cell. No anomalies were noted.